Zelfzorg, het antwoord op stress en burn-out? 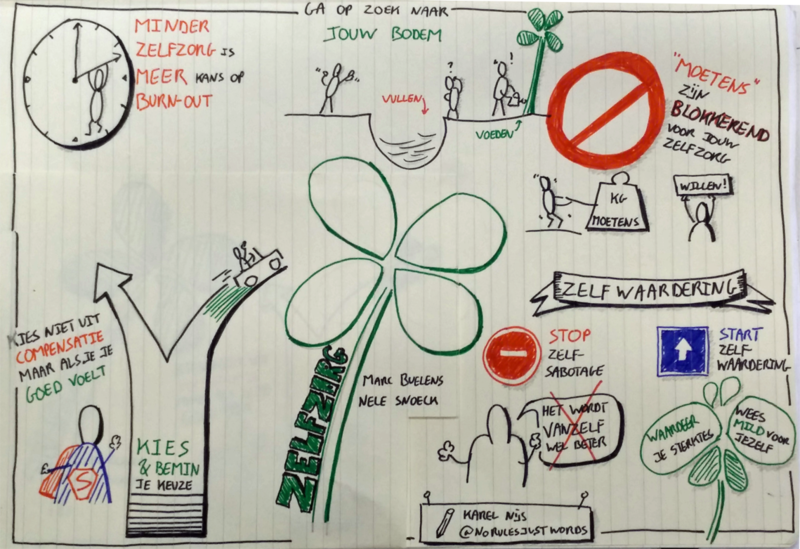 Graphic recording van de sessie “Zelfzorg, het antwoord op stress en burn-out?”. De voorstelling bestond uit 2 delen: ‘Wie niet goed voor zichzelf zorgt, kan ook niet voor een ander zorgen’ een monoloog door Nele Snoeck, actrice & opleider, en ‘Zelfzorg, een permanente uitdaging’ door Prof. Marc Buelens, Vlerick Business School. In “Let Me Blow Ya Mind” EVE sang “Frustration baby, you gotta breathe”. Read further to see if the following sounds familiar. You push the elevators button and while waiting time passes by. Waiting seems like ages and you decide to push the call button again. There must be something wrong. The system doesn’t seem to react. You get annoyed and hit the button a third, a fourth, maybe a fifth time. Gently the door opens and you look a bit ashamed to your left and right to see if anybody has noticed. Does this sound familiar? You are maybe a little stressed; convinced that every second counts and the system/world has other plans for you today. Draw a doodle in the middle that represents you. Draw your current feeling onto your doodle. If you are annoyed, your doodle should represent it. Create a mindmap with as first layout all the topics that are in your head. Be specific, but do not dive too much into the details (yet). The majors topics could be for example: redecorating your house, a new assignment at work, a conflict with a colleague, a friend or your spouse. For each major topic, list all the things that you need to do for it and why you worry about it. If needed, create subtopics. Take a moment to step back and reconsider your feelings. Is it really needed to worry so much? To get agitated that hard? Time to dive in! Let’s take on the challenge and mark the three utmost important topics. These get priority. For the other topics, pick a mitigating action. Make sure that you don’t put an important item on the non-priority list and regret it later. Checkthe mindmap to see if all your frustration maybe leads to only one topic.